Emma made all of the wrong choices in Once Upon a Time Season 5 Episode 5 and they were quickly coming back to haunt her with the people she loved the most. Things looked so promising when they began. Emma figured out that Arthur had put Snow and Charming under a spell, and she and Regina worked together to get Merlin out of the tree. Thanks to the memories from the dreamcatcher, Regina was able to figure out that a tear from true love’s heartbreak could be the key to breaking the spell. That’s when things began to go sideways. When Regina’s tears over Daniel wouldn’t work, Emma ripped out Violet’s heart and made the girl tell Henry she only wanted to be friends. Poor Henry had never felt such heartbreak in all his 13 years. Watching Henry court Violet with soda and movies was very sweet. 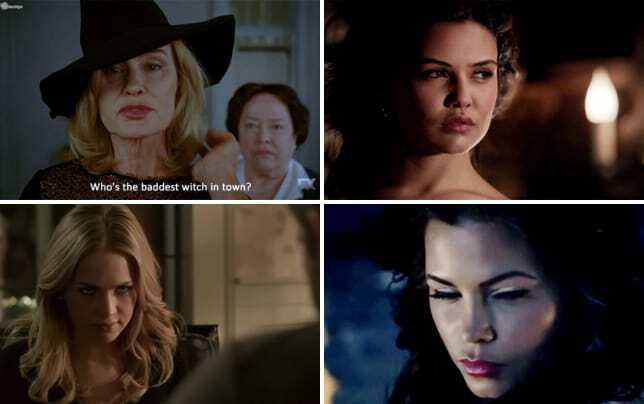 Emma and Regina's advice to be himself was right on target, if only Violet had been allowed to follow her own heart. On the upside, the plan worked but the the downside was devastating. Up until that point Henry had kept the faith that his mother loved him and could fight this dark curse, but now I wonder if he’ll ever look at her the same way again. Unfortunately not even losing Henry’s trust seemed enough to shake the dark hold over Emma’s heart. If I'm the one on the moral high ground, you've fallen quite a ways, Ms Swan. Permalink: If I'm the one on the moral high ground, you've fallen quite a ways, Ms Swan. Elsewhere, Merida tried to turn Rumplestiltskin brave in what was probably the only way possible…she threatened Belle. Well, not Belle directly but the chipped tea cup that represents their love. That got Rumple to pick up that sword and fight back, but I don’t believe that will be enough. It’s going to take a real threat against Belle’s life to get Rumple to be truly brave. Thankfully there wasn’t nearly as much King Arthur and Queen Guinevere this week. For me, a little goes a long way, but I was wondering what happened to Lancelot. Is he still locked up in the dungeon? Also, was anyone else expecting an old bearded man to come out of that tree? Who knew that Merlin would be so young and cute? Now that Regina knows about the dreamcatcher, will she be able to figure out what happened in the time between Camelot and Storybrooke? Can Emma be stopped from reuniting Excalibur with the dagger, and if she does, will she get rid of all the dark magic or the light? 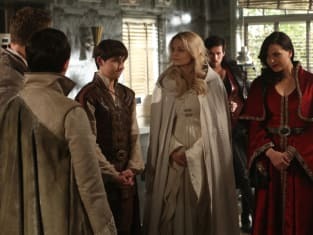 Check back later in the week to see what our Once Upon a Time round table team has to say about “Dreamcatchers,” and then next Sunday for our review of Once Upon a Time Season 5 Episode 6. If you want more magic now, you can watch Once Upon a Time online here at TV Fanatic.